Tartan fabrics woven in bulk and then supplied from stock by their weaving mill are normally available to order with a minimum length of only 1 metre (1.1 yards). 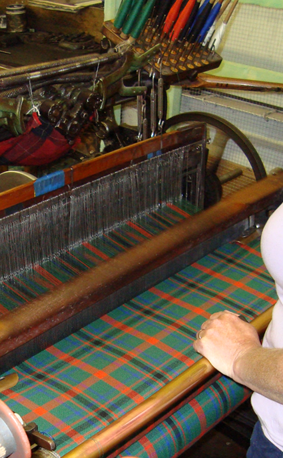 However, the practicalities of the weaving process means that for custom woven tartans from our Glen Affric weaving mills (glena and glenb) we have to produce at least a few yards (or meters) of any fabric for you. This is because arranging the threads and setting up the weaving loom is the most time-consuming part of the weaving process. So there is always a minimum order value, which may be higher than the price of individual products. But our minimum lengths aren’t high! In fact you’ll struggle to find another company able to weave just a few metres (about a single kilt length) of your rare or unique design - and especially not at such affordable prices. Actual minimums vary from fabric to fabric, which are shown as you browse the choices. And note that some fabrics are woven in ‘double width’ more economically, though the headline price per metre (yard) may be lower. Our products are priced on an individual basis, allowing you to order multiple items in the same fabric, to make up the minimum weave. The amount remaining to make up the minimum in your chosen fabric will be displayed in your Basket when you add items. You will find a link there to other products available in that fabric. Or if there is fabric left over after any garments or other products you order have been made, we will supply this remainder to you with your order. Please contact us if you are unsure. If you choose more than one fabric (e.g. a heavy weight wool for one garment, and a light weight wool for another) the minimum length will apply to each.